Colorful eye pencils are a fun way to add color to your eyes without worrying about shadows and blending, etc, but sometimes using medium- to light-colored pencils can cause your eye line to look very undefined. This is where double-lining comes in use. This typically means stacking two lines in different shades. When you use this technique for definition, the lower line tends to be a dark brown or black shade. This application method (layering one shade over another) is also a lot easier for beginners than the non-overlapping method used for two colored lines. 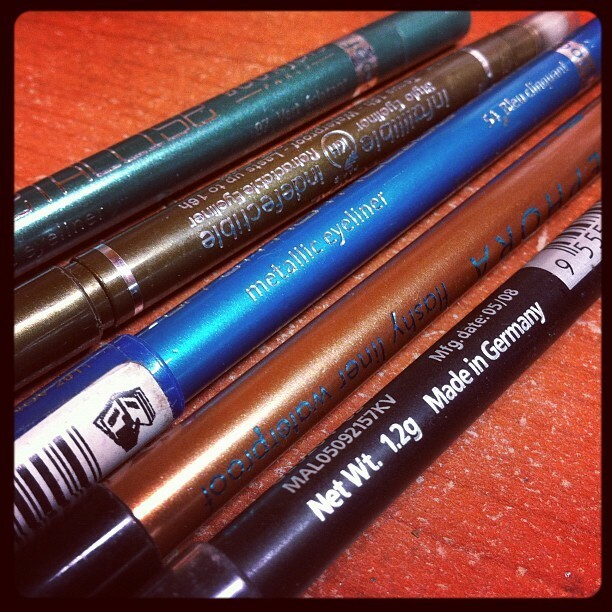 Step 1: First, apply the colored liner along your upper lash line. Anytime you do double-lining, the upper line should be thicker than you usually apply it because half of it is going to be "covered" by a second liner. I prefer to apply the pencil diagonally up and out, making it thicker at the outer corners. Step 2: Now, fill in the area under the initial line, making it a thick, solid swatch. 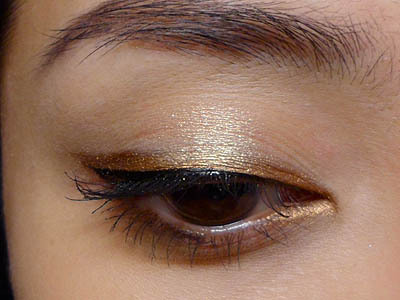 If the shade you chose is quite light (like the bronze I chose; Sephora Flashy Liner in Flashy Copper), go ahead and apply it in the inner corners of the lower lash line as well. Step 3: Double-lining. Using a liquid allows you to get the most opaque line with minimal fuss. If you're not comfortable using liquid liner, I suggest using a gel liner instead, as a regular pencil is not likely to give you a very precise line when layered over another pencil. Run it along the lash line, leaving no gap above the lashes. At the outer corners, follow the slight flick drawn by the pencil, so that both lines end at the same point. Step 4: Apply black mascara to finish. 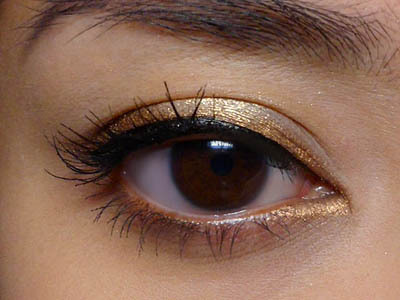 Then as a finishing touch, to add a bit of a subtle glow to the lids, add a touch of pale gold or bronze to the center of the eye, overlapping the colored liner, but not the black. Cute :) I am going to do this tomorrow! I'll go for metallic blue.Thanks for the tips!